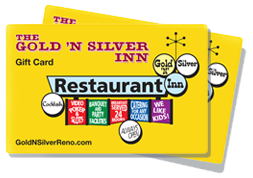 The Gold ‘N Silver Inn has been a Reno landmark for over 60 years. Over three generations of locals know the Gold ‘N Silver for consistently good food, friendly prices, and the warm welcome they receive at every visit. The Locals Place to Eat and Play! Quarter Bonus Poker with a 99.4% payback. Kick back in our Cocktail Lounge. Open everyday at 2pm. Cocktails available in dining room 7am-10pm. Our Banquet Room hosts service groups, auxiliaries and over 300 meetings a year.